Shortly after my meeting this consultant, I went to LACMA to see Metropolis II (more like I was simply hypnotized by it). It is an ambitious, sprawling commentary on L.A.’s transportation culture and offers a frightening glimpse into the what’s to come. It’s Hot Wheels on PEDs. Watching the cars amble up the ramp then quickly rocket through a complex labrynth of urban sprawl (including a bisected disco ball or 2), I caught myself daydreaming of a day when my morning commute would look like this (without the gridlock). 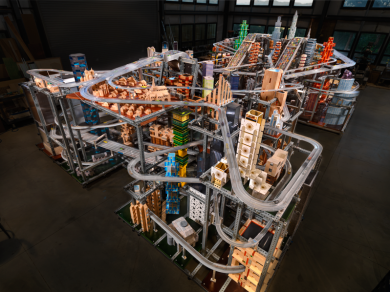 According to L.A. Weekly, during the opening of Metropolis II Chris Burden predicted “The future of automobile transportation is that there won’t be drivers anymore”; apparently the crowd wasn’t having it, but not so fast nay sayers. Bill Howard of Extreme Tech, noted that the Google Car recently made an important safety milestone, and Ford is working on the technology that will serve as the foundation for autonomous vehicles (be sure to watch the Google vid). Looks like 5 years may not be so far fetched after all. Metropolis II from CultureShockArt on Vimeo.